Comedian Imaan Hadchiti takes audiences on a hilarious and eye-opening ride into his world in A Little Perspective. The multimedia mix of stand-up comedy and video clips explores perceptions of socio-political corrections from the worm's eyed view of a shortstatured, un-abled body, height deficient, disabled, incumbently insufficient, vertically challenged Lebanese comedian - with a hidden micro camera, which captures the cringe worthy comments and actions that Imaan faces when he goes out. 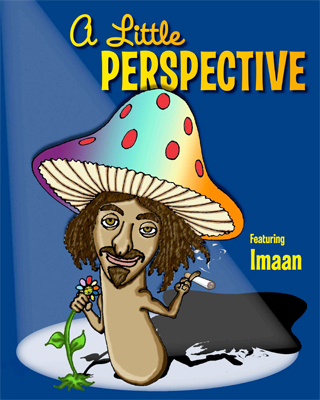 Imaan's composure, ability to identify, empathise and challenge standard beliefs has granted him a unique place in the world of stand-up. Fresh from a sell-out season at the 2011 Adelaide Fringe Festival, A Little Perspective is coming to the Melbourne International Comedy Festival on Thursdays to Sundays at 11.30pm, from 31st March at Hairy Little Sista, 240 Collins Street, Melbourne. Once you've seen Imaan, and finish laughing, you'll leave with the delightfully dirty sensation that, as a tall person, you've been exploited. Question: What inspired the A Little Perspective show? Imaan Hadchiti: I walk around a lot and I get asked a lot of weird question - I have been telling people stories of all the things people do and no one tends to believe me, so I thought 'I might as well film it'. Question: What should audiences except from A Little Perspective? Imaan Hadchiti: It is a lot of fun and it is not a preachy-kind of show, I just wanted to show people what happens when I walk around and there are some crude jokes, as well! Question: How is your show different to other comic shows? Imaan Hadchiti: The main difference is the television part; my material is a little cruder than usual which is why I am on late. I am a little bit ruder than most comedians, but I do it with a cheek, so I get away with it! Question: Why did you choose to include video clips in your show? Imaan Hadchiti: I wanted to show people the ignorance that is around. It is a hidden camera that I filmed all the nightlife of Melbourne and all the weird things that happen. I was fed up with being hassled, all the time, so I thought I might as well make a show about it. Question: How did audiences in Adelaide react to A Little Perspective? Imaan Hadchiti: They loved it! I had a really good response in Adelaide; a lot of people were too busy being anger by some of the clips to laugh. Question: When did you decide to start a career in comedy? Imaan Hadchiti: I started comedy at 15. We were doing work experience and I didn't know what I wanted to do other than wanting to be a comedian because I thought it would be a good job, getting paid to be a smartarse. I followed around a comedian, for work experience and I competed in a competition called Class Clowns which is similar to the competition, Raw, for under 18s. I won Class Clowns and since then I have continued with comedy because I obviously have a knack for it. Question: What has been your biggest career challenge? Imaan Hadchiti: My biggest career challenge has been trying to do material that is not about my height. I like to broaden my material but every time I go on stage, audiences want to see me tell 'short jokes' so I have changed my normal material to jokes about people looking at me. It has taken me a while to get that twist perfected but now I have found my voice. Question: Where do you get your ideas for comedy shows? Imaan Hadchiti: I find my material around me, mainly when I am talking to my mates. When you are talking to your mates you are often talking about stupid things, especially things that don't make any sense and that are where I get my material. I am a smartarse around my life and I write it down and implement that into my shows.